Yeah I'd hate that too. Good lord GM... can’t get the new 10spd with a towing package and 4wd. Back to the Yukon Denali. Even used that’s over 50k for a half ton gasser suv and no 10 speed either. I just don’t understand... lol why does GM release an amazing new trans and limit what you can get it in?!? Last edited by patrick232; 10-10-2018 at 06:37 AM. I love the Yukon/Tahoe/Burb’s... but the prices have gotten out of control. Oh, and I tried to build a RST Chevy with the 10spd and 4wd. You can’t get the heavy towing package! Wtf?!? The RST 6.2L with 10speed is only available with the 3.23 axle ratio and that is the towing killer, honestly even the 3.42 is weak sauce. With 22” rims it’s even worse. Although the RST does appear to tow 8100# which is near max for any suburban package. With the same transmission, Ford offers the 3.55 ratio, makes a big difference in towing. Last edited by larry_arizona; 10-10-2018 at 09:08 PM. It will likely be next season before I hook the boat up to the suburban but I will report back on how it tows. My 6.2 Silverado with a 6 speed transmission (and 3.42’s if I recall) does a fine job, so I’m guessing the 6.2 Suburban with a 10 speed and 3.23’s will too. I have no doubt you will be plenty happy pulling 5700# max (boat and trailer weight) with that Burban. I mostly use the wife's '16 slide esv (8 spd) to tow the Max and it does a solid job. Due to the air suspension have to use a 4" drop ball. Average 9.5 towing when we took it to central Texas. I would estimate its a bit heavier combo than 5700# though. Believe the boat dry weight is 4400#, add 60ish gallons of fuel (400#) and then in my case 750# lead and looking closer to 7k not including another couple hundred in gear/anchor. Really looking forward to trading it in for a lightly used navigator with that sweet HO 3.5 in a couple years. Have towed with my fathers plain jane '16 ecoboost 3.5 with just the 6spd and power wise I liked it better than the 6.2 in the slade. Gas mileage is not any better, but similar to a diesel rather than kick down a gear it just spools a bit more boost since at towing speeds you are basically in the fat end of the torque curve. Last edited by FamilyMan; 10-31-2018 at 04:34 PM. My wife got the front windows/windshield tinted and I lowered the rear ~2” with some drop springs and shock relo brackets to level it out. 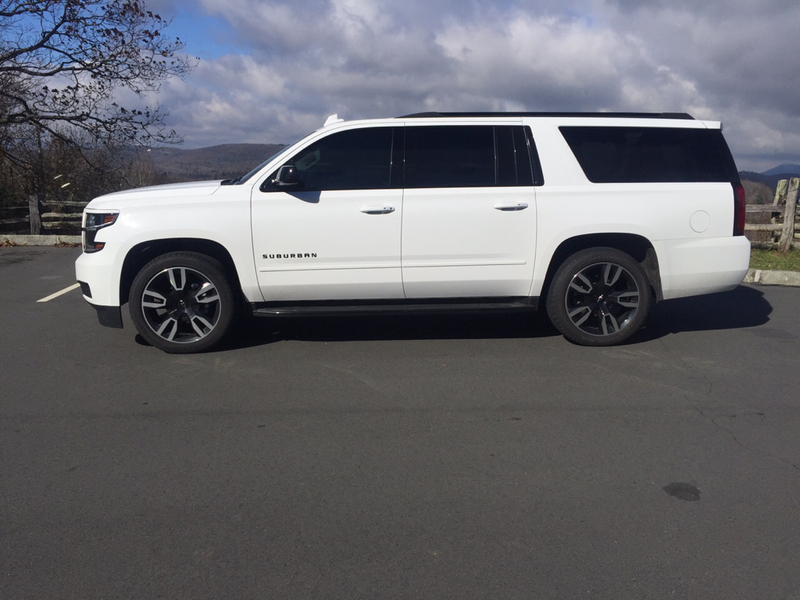 We are really enjoying the suburban! Here’s a pic on the blue ridge parkway from trip to the mountains a couple weeks ago.